Big day tomorrow with most D.T.W.C. 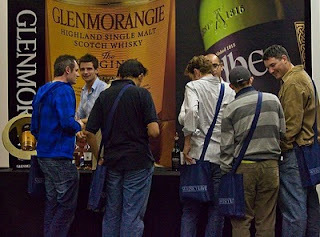 members attending the Whisky Live Sydney 2010. 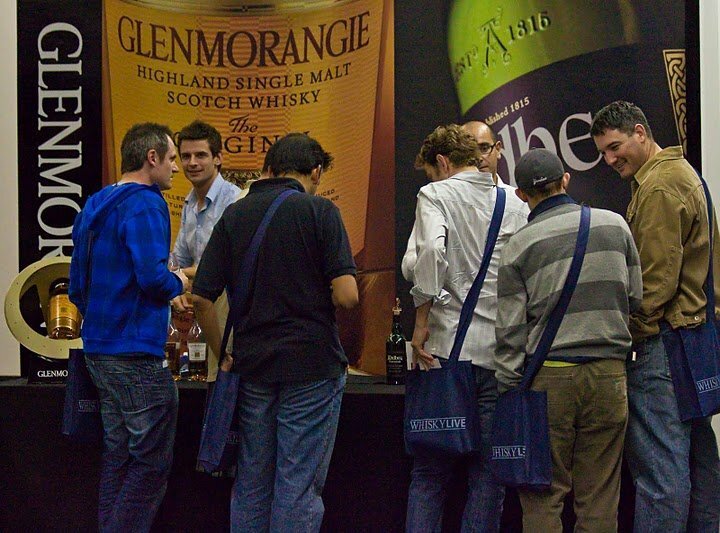 Unfortunately, I could not be in attendance last year...though from all accounts the whisky flowed all too freely when stands were left unattended or poorly managed. I know this is all very negative for a start to this post but it certainly reflects my low expectations of what is to come. However, I am still looking forward to the event. Accounts from members were certainly enjoyable so looking forward to experiencing it for myself. As you will see from the photo above a certain member is keenly discussing how awesome the Ballechin Port Cask Matured tastes, recommending all members to buy it (little did he know that particular member was yet to attain the title of The Converted). There is a change of location, from Sydney Harbour views (last year) to Royal Randwick Racecourse. Also, a big line up of distillers are displaying including some bourbons, so there should be a good variation. Potential for a good many heckles at the shameful Finlaggan (I cannot believe such a poor whisky will even be appearing, but then you need the poor to enhance the rich). I pity the fool who wastes a dram voucher on them. Accounts of the 'V.I.P. lounge' being nothing more than a roped off piece of carpet with plastic chairs (last year) has not enticed me to pay the extra money for the privilege. It does sound like they have made more of an effort this year though. When there are ten drams to be sampled over four hours with a standard ticket, I think I will get more than my fill by evenings end (even a standard club meet does not generally consume ten drams in five hours, though some none the prettier have made this achievement). Probably the most disappointing thing so far before even the start of the event is the simple fact we have to miss out on the Talisker Master Class, which has been scheduled to happen right in the bloody middle of the four hour event. For god sake Whisky Live organisers, why would you do such a damned fool thing. WHY?! Scheduled for the Talisker Master Class is a tasting of the Talisker 10, Talisker 18, Talisker 25, Talisker 57 North and Talisker Distillers Edition. Regarding the master classes, WHY WHY WHY are the classes not held outside of the Expo times...perhaps leading up to or repeated twice during the day. Leading up to the event is the exciting and first semi-unofficial meeting of the Distant Thunder Bourbon Club (tonight, 27th August 2010 and Casa-de-Blackness). D.T.B.C is a sub-faction of the Bourbon Fundamentalists creeping into the seems of the D.T.W.C. (Alchemist, where are you for this one)? On the tasting menu tonight is the simple Makers Mark (levelling the pitch), followed by the opening night of Buffalo Trace and Jefferson's Reserve Very Small Batch (reviews to come). In the end, reservations aside, it will be good to see the band of brothers together again. Will it be a Whisky Live or a Whisky Dive? We will be the judge.